1965 Chevrolet Vette factory original full Hub Caps with Spinners in fair condition, few pitting marks, light scratches, dings/ small dents, driver quality, crossed-flags emblem, for 15 inches steel rims, further you stand back the better they look $125. Pair. Shipping is available upon request pay with Interac e-Transfer or PayPal. 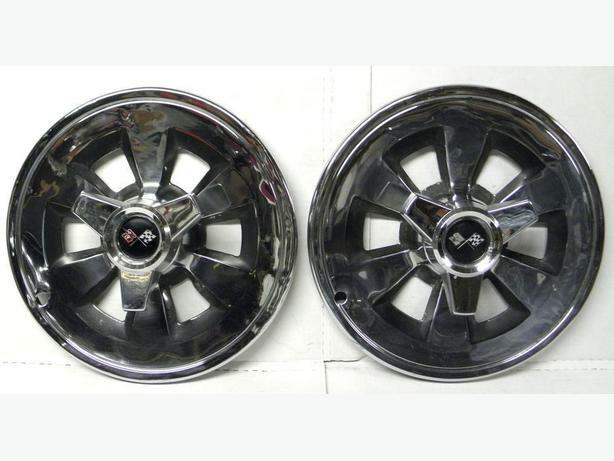 This would also look good on front of 66 67 Chevelle Malibu, Chevy II Nova, early Camaro and Impala SS with black steel rims on the rear just like early Hot Rodding days.